This weeks bloggers challenge was to use chipboard in a project or on a card. Pretty easy for me - cause I love chipboard. I created a wedding squash book - my chipboard is covered by the Damask Notepad designer paper - perfect for a wedding! 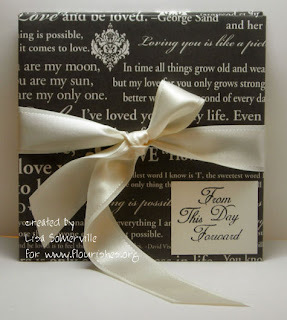 The sentiment is from Flourishes Wedding Essentials set, and the beautiful ribbon is also available at Flourishes. Card Stock (cut 3 - 8 1/2" x 8 1/2", score in half, open and fold in half the other way, open and fold on a diagonal. You'll now have 2 squares and 4 triangles. Line up the squares in this order: facing up, facing down, facing up. Overlap the squares and attach with adhesive. Push the triangular sides in and "squash" into a square. Squash the album. Use sticky strip to adhere the covers to the album. Tie the ribbon in the front to hold the book closed. This weeks bloggers challenge came at a great time - Stampin' Up! will be having a Chipboard Special during the month of May! This offer is being made in conjunction with a Cutting Mat/Hobby Blade combo pack special offer; click here for more details. Very elegant looking! Love the colors - very striking! Great job! Great idea to point out the chipboard promo too. Great job, Lisa...love the idea of a wedding squash book! Very pretty! Would make a wonderful wedding present or shower gift. I like the new look of your blog! Lisa this is exquisite. Love love love that you used black for a wedding book - it's so elegant! Very kewl Lisa, pretty and useful too! OMG, Lisa. This is just beautiful. Off to START my project now...gotta find the chipboard first. I love it! It is very elegant! It's been forever since i have done a squash book! This is a stunning book Lisa, and one that anyone would love to receive. Great job, absolutely fabulousl. Wonderful and Elegant. This is really nice! Lisa! Your squash book is so elegant. That paper is so pretty, too! This is so pretty and elegant, Lisa. It would make a special and memorable gift. Another GREAT idea for a mini album! Great job Lisa! You are so creative and this squash book is adorable, perfect for newlyweds! beautiful project Lisa!! very elegant!! Stunning! Such a lovely gift....and these books are such fun to make.